President Trump continues the dismantling of his predecessor’s programs without Congressional involvement by signing an executive order that would prohibit HHS from paying legally required (but also legally challenged) premium-lowering payments to insurers. A CBO report from August predicted that such an order would increase premiums 20 percent immediately and increase the federal deficit by $194 billion over ten years, but would not significantly increase the number of people without insurance. The immediate effect on the open enrollment period that starts in just over two weeks will vary by insurer and state. Some insurers built the expected action into their new premium prices, others advised insurers to assume the payments would be made in setting their prices, and the timing of the executive order makes it unlikely that insurers can get re-filed rates approved before enrollment begins, raising the possibility that they will pull out of the market. Eighteen states have sued the White House over the executive order. HHS Acting Secretary Eric Hargan and CMS Administrator Seema Verma release a statement supporting the order and criticizing the laws they swore to uphold, saying that “Obamacare is bad policy” and that cost-sharing reduction payments were authorized in an unlawful “unconstitutional executive action” (which is arguably true and the subject of the legal challenge). From Faith-Based Hill: “Re: Outcome Health. Overstating claims and fudging numbers will get you hundreds of millions in investment that you can use to buy time to hopefully turn things around. Too often the poor schmucks who try to build legitimate, ethical business get no such boost. The VC/PE world is ripe for such perverse incentives. A $5.5B valuation for putting TVs in doctors’ offices so Rx companies can prey on (cough, cough) I mean advertise to patients? How is this innovative? How is this going to actually benefit patients, lower costs, and (as their name ironically suggests) really improve outcomes? Sorry for ranting, but these Theranos-esque shysters make EHR vendors look like friggin’ Mother Teresa by comparison.” I’ll be interested to see how Outcome Health, as a privately held company, proceeds and how investors and customers react. Companies usually fire a few mid-level executive serving as scapegoats (giving them big go-away money and an ironclad NDA to prevent them from saying what really happened); apologize; and claim that the public penance marks a new chapter in the newly reinvented company’s inevitable destiny. The worst thing about Outcome’s business model of promoting drugs to patients at their vulnerable moments is that it works – doctors naively think they are immune from pharma propaganda and irrational patient pressure, but prescribing data proves otherwise. The most important “outcome” is boosting pharma’s bottom line. It’s distasteful to be reminded constantly that healthcare is like all other industries in being driven almost exclusively by profits, which was inevitable going back to the 1960s, when Medicare made the potential economic scale interesting to investors. From Desperado: “Re: Cerner. Next CEO is … Zane Burke.” Unverified, but hardly shocking if true. CERN shares appeared (from my quick graph look) to have hit an all-time high after a nice run-up last, week, closing Friday at $73.57 as the company’s market cap approaches $25 billion. I’m happy that Burke at least earned an advanced degree (MBA) since so many healthcare executives rose through the sales ranks where graduate education is seen as a waste of time. From ImageEnabler: “Re: Philips. Now requiring customers migrating away from their iSite PACS solution to use their third-party migration vendor of choice. Who owns the data again?” Unverified. From Dr. Trump: “Re: ACA. Will Trump’s repeal of the health insurance subsidies and encouraging cheap individual health plans benefit Oscar Health, Joshua Kushner’s startup?” I expect so. The struggling Oscar was on the wrong side of Trump’s ACA wrath when he was elected since the company sold ACA plans, but it announced in April that it would start selling the kind of individual plans that will probably gain business from the executive order. Incumbent HHS Secretary “None of the above” remains the favored candidate of poll respondents, although readers expressed tepid enthusiasm for having HUD Secretary Ben Carson swap chairs. New poll to your right or here: what is the clinical and healthcare business impact of not having a national patient identifier? AHIMA announces its plans to offer a health informatics certificate. The Internet goes dark in many parts of the country when hackers hit DNS routing company Dyn. Wolters Kluwer announces that it will acquire Health Language. NYC H+H’s board minutes explain why it chose Epic to replace QuadraMed CPR, a decision that led Allscripts to sue the health system for giving Epic the bid in what it claimed was improper procurement. Google shares drop sharply when its financial printing firm releases the company’s SEC Form 8K in the middle of the day instead of after hours. An IOM report finds that a health system co-managed by the DoD and VA s is spending an extra $700,000 per year for pharmacists to enter prescription data, required because their separate EHRs cannot create a sequential prescription number. Medsphere settles its $50 million trade secrets and contract breach lawsuit brought against founding brothers Scott and Steve Shreeve. Eclipsys announces plans to move its headquarters from Boca Raton, FL to Atlanta. A Misys report concludes that doctors don’t use EMRs because they are expensive and hard to use. A Wall Street Journal report says that waiting room digital advertising company Outcome Health misled investors about its advertising performance as fresh investment sent its valuation soaring to $5 billion. President Trump signed an executive order that allows people to sidestep exchanges to buy less-expensive but less-comprehensive policies, a move that threatens to further destabilize ACA insurer risk pools. Express Scripts announces plans to acquire EviCore Healthcare for $3.6 billion. Pine Rest Christian Mental Health Services (MI) chooses Epic. Former CMS Acting Administrator Andy Slavitt joins growth equity firm General Atlantic as special advisor, focusing on healthcare investments in underserved populations. HIStalk readers are cited in General Atlantic’s announcement for voting Slavitt as their “Healthcare IT Industry Figure of the Year” for 2016. 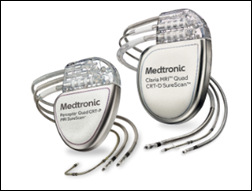 Hospital operator Mercy’s IT organization and device maker Medtronic will work together to capture de-identified data from heart failure patients to analyze their response to cardiac resynchronization therapy. Medtronic, based in Ireland after a controversial 2015 move of its US headquarters to Dublin to dodge US taxes, sells an implantable device that offers that therapy. Two senators write to President Trump to inquire why he declared on August 10, 2017 that “the opioid crisis is an emergency and I’m saying officially right now it is an emergency” without following through on the legal rather than the rhetorical declaration that is required to take federal action. A Microsoft executive says that the government of North Korea was responsible for using stolen NSA tools to create the WannaCry malware that hit hospitals hard earlier this year. 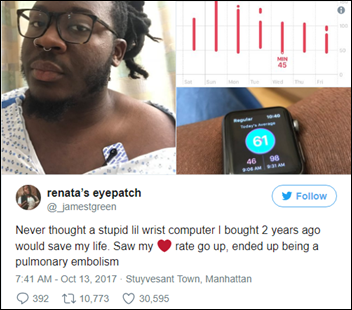 A 28-year-old New York man and self-described “serial data tracker” says his two-year-old Apple Watch saved his life by alerting him that his heart rate had jumped, which turned out to be a symptom of a pulmonary embolism that was successfully treated. Patients in England report that their doctors are ridiculing and threatening patients who research their issues on the Internet before a visit. 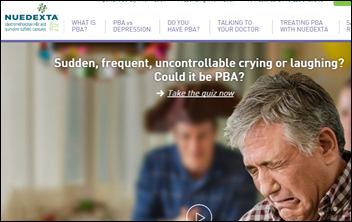 CNN finds that drug companies are making hundreds of millions of dollars each year – much of it paid by Medicare – on Nuedexta, intended for treating a relatively rare condition that causes laughing and crying in multiple sclerosis patients, but being aggressively marketed by salespeople for dementia patients in nursing homes. Its manufacturer has also paid many millions to doctors in honoraria and consulting fees, with doctors who have received those payments being responsible for nearly half of the Medicare claims paid for the drug. Nuedexta, which costs over $9,000 per year, contains two ancient, dirt-cheap drugs – dextromethorphan (in over-the-counter cough syrups) and quinidine sulfate (a bark-derived heart drug that’s so old that nobody can remember when it was first used). The unfortunately not-rare condition it causes rather than cures is excessive pharma laughing all the way to the bank. A visitor is stabbed to death in his son’s hospital room at Johns Hopkins Hospital (MD), with police investigating a domestic issue trying to determine whether it was murder or suicide. 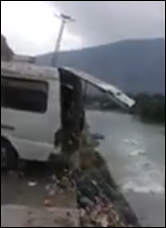 In India, a bystander captures on video a hospital dumping its medical waste into a river. Weird News Andy is singing “Sole Man” while failing to identify a good ICD-10 code after reading this story. A man in England goes into cardiac arrest after swallowing a six-inch Dover sole, saved by a first responder who was able to remove the fish after six tries. The man claimed that the fish spontaneously leaped from the water into his mouth, but a friend told the first responder that the intrepid angler was fooling around by putting the just-caught fish over his mouth, only to be rendered speechless when it wriggled down his throat. Harris Healthcare will exhibit at AHAAM’s Annual National Institute Conference October 18-22 in Nashville. Vocera will exhibit at the ANIA DFW Clinical Informatics Academy October 18 in Grand Prairie, TX. Black Book ranks ZeOmega number one for care management workflow applications, and includes it on its list of Top 50 Disruptive Health IT Companies. It wasn’t Medicare that started this craze with prescription drug ads but the FDA loosening restrictions in 1997 and pharma companies pouring money into DTC since then. It was $377 million in 1997 and surpassed more than $6 billion last year. That represents a 14.8% CAGR in the growth of pharma DTC advertising over that time span. What is more interesting is that legal weed is starting to seriously steal the thunder from the Mexican drug trade and legal pharma. While the cocaine trade may still be booming, the pot game is plummeting. As of March 2016, Southwest border seizures of marijuana had dropped to around 1.5 million lbs compared to almost 4 million lbs in 2009. There are various estimates I have also seen that say pharma has been losing $50-$100 million in drug sales annually in the US to legalized marijuana (mainly medical marijuana) already. Pharma has more than $4 billion dollars annually of US drug sales potentially at risk if legalized marijuana is widely available in all 50 states. I am going to say false on that statement that Zane is the new CEO. Now, that doesn’t mean it cannot happen, but given that it has been 3 months since Neal’s passing, if they had decided on an internal candidate, it should have been announced already. Not to mention, CHC, would have been the prefect time to announce him as CEO. That didn’t happen, which gives pause to think that it might very well be someone from the outside. Logically, it just doesn’t make sense to have an internal candidate take over, but not publicly name them at their own Conference. That would have created a great “buzz” and increased attendance.